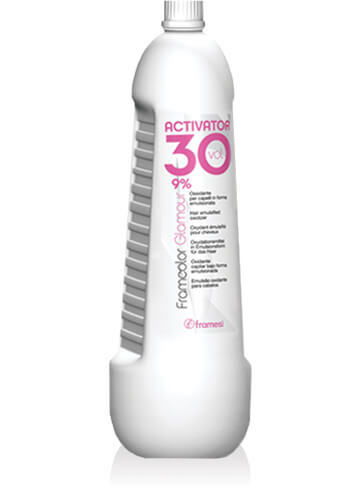 Framcolor Glamour is a permanent hair color line 100% coverage with all shades and no intermixing. Perfectly calibrated level system with pre-blended bases that offer vivid results. Mixing- 1:1 mix ratio with Framcolor Glamour Activator for 3-4 levels of lift. Water (Aqua/Eau), Hydrogen Peroxide, Cetearyl Alcohol, Lauryl Alcohol, Etidronic Acid, Ceteareth-20, Disodium Phosphate, C12-15 Pareth-3, Myristyl Alcohol, PEG-40 Castor Oil, C12-15 Pareth-3 Phosphate, Cyclopentasiloxane, Laureth-7, Simethicone.